When making the daily rounds through social media streams, it’s way too easy for me to devolve into cynicism. Between the shouty political noise and clickbaity look-at-me clamoring, it can all be a little much. But this, this is an example of the power of genuine, authentic faith in Jesus to cut through the noise and brokenness of our culture. Ingrid Williams, the wife of Monty Williams, the associate head coach of the Oklahoma City Thunder, was tragically killed in a car accident last week. I’m going to close with this, and I think it’s the most important thing that we need to understand. Everybody is praying for me and my family, which is right, but let us not forget that there were two people in this situation, and that family needs prayer as well. And we have no ill will toward that family. In my house, we have a sign that says ‘As for me and my house, we will serve the Lord.’ We cannot serve the Lord if we don’t have a heart of forgiveness. That family didn’t wake up wanting to hurt my wife. Life is hard. It is very hard. And that was tough. But we hold no ill will towards the Donaldson family. And we, as a group, brothers united in unity, should be praying for that family, because they grieve as well. Normally, I’m in the don’t read the comments camp of Internet browsing. Too often, the comments are worse than a schoolyard with their no-you’re-the racist accusations and anonymized name-calling. It’s always heartwarming when a true Christian is heard from. I am not religious, but I believe the teachings of Christ is the lessons of forgiveness. Forgiveness is what you need in your heart to look at others and understand they grieve too. To turn the other cheek, sometimes you need to see through the eyes of others, as painful as that might be. The test of your beliefs is when you are in the darkest place, when everything is crumbling. It is truly awesome to behold. Damn. Those sentences right there. Stopped me cold and made me think. What a powerful thing to say in such a simple and concise manner. 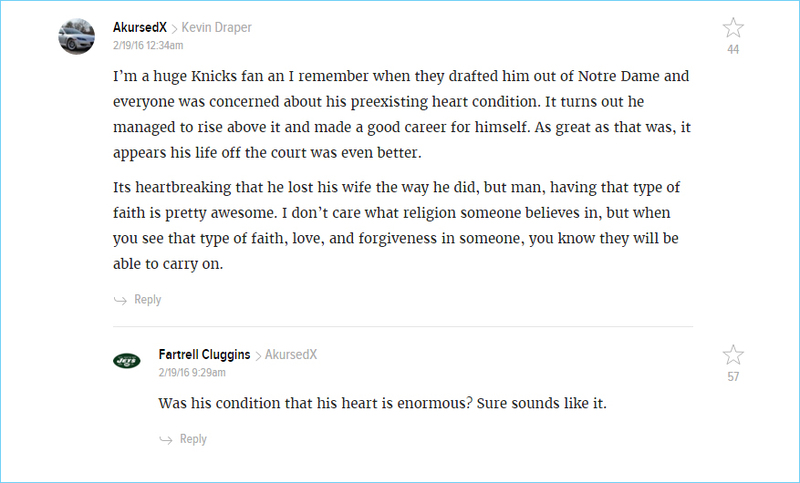 I’m a huge Knicks fan an I remember when they drafted him out of Notre Dame and everyone was concerned about his preexisting heart condition. It turns out he managed to rise above it and made a good career for himself. As great as that was, it appears his life off the court was even better. Its heartbreaking that he lost his wife the way he did, but man, having that type of faith is pretty awesome. I don’t care what religion someone believes in, but when you see that type of faith, love, and forgiveness in someone, you know they will be able to carry on. Was his condition that his heart is enormous? Sure sounds like it. May the peace of our Lord Jesus rest upon the Williams family as they navigate their sorrow and loss, and may they continue to walk in such genuine faith. One of the threads I saw running throughout The Ideation Conference (you can find other reflections here) was the importance of good storytelling. Many (most?) nonprofits struggle to raise awareness for their work, find donors and raise support. From organizations such as Invisible Children, One Day’s Wages, charity: water, and Nuru International, it is clear that communications is not a nice touch to throw on at the end if your organization has time, but a crucial part of the work itself. Stories that grip people’s hearts will naturally lead to participation and contribution. And telling those stories requires a willingness to invest. Why do you believe in your work? Why should your friends & family? One of the speakers at The Ideation mentioned that, if you can’t get your immediate family behind your idea, then maybe you need to re-think things a bit. Via marketing maven and all-around social networking guru @decart, here are some useful tips on creating a hook for your story and engaging your members. Among both charity: water and Invisible Children’s first hires were their creative teams (or, at the beginning, creative person). As charity: saw the need for telling their story through videos, their creative took on the task of learning how to edit video, and they grew from that point. At The Ideation, I met and/or connected via Twitter with many talented videographers, graphic designers and organizational consultants (as well as in-house creatives) who passionately care about people and finding ways to create a better world. If your organization does not have the capability to produce creative content on your own, there are many who can help you out (at a reasonable cost). In any case, organizations must be willing not only to invest financially in communicating their stories, but also in time, imagination and hard work. At The Ideation, I was privileged to represent Justice Ventures International — a nonprofit working to eradicate human trafficking, empower the urban poor, and ensure access to justice for the oppressed — as a board member and as part of the Pathos Ethos team — a web strategy group finding ways to partner with organizations working to love human + do good in the world. One of the things our family enjoys about the free Booksneeze review program is the occasional DVD that comes along. My daughter has enjoyed Gigi videos in the past, so she was really excited to watch this one, Gigi’s Big Break. This is the second Hermie DVD I have received via the Thomas Nelson Book Review Blogger program, now known as Booksneeze (sounds a little gross, but the idea is “Great books are contagious”). Friday Freebies: Happy New Year! In the meantime, get a free movie rental at Amazon.com (didn’t realize they were renting out movies — this must be their intro marketing campaign?). The Freeze Project San Diego video is now online! Today, there are over 27 million people trapped in slavery and human trafficking — more than at any other time in human history. The US State Department estimates between 600,000-800,000 women, children, and men are trafficked across international borders each year. Approximately 80% are women and girls and up to 50% are minors. And yet, so many people are unaware of this global nightmare. Through The Freeze Project, we are raising awareness for those trapped in this terrible injustice. Join the movement and raise your voice for freedom! Special thanks to Shirley Hwang for spearheading The Freeze Project San Diego movement and to Joe Baek for filming and editing the video.